Interior compartment includes multi-section lift out tray--just right for storing books, movies, video games, etc. 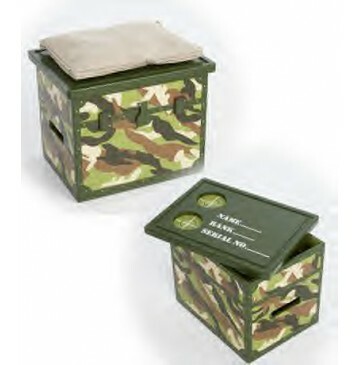 Handy removable and reversible lid--great when it's time for a little "R & R!" One side can be personalized with "NAME, RANK, & SERIAL NUMBER" and includes two cork-lined drink holders. The other side reverses to a desert beige padded cushion. Free Shipping, usually ships within 2 business days.